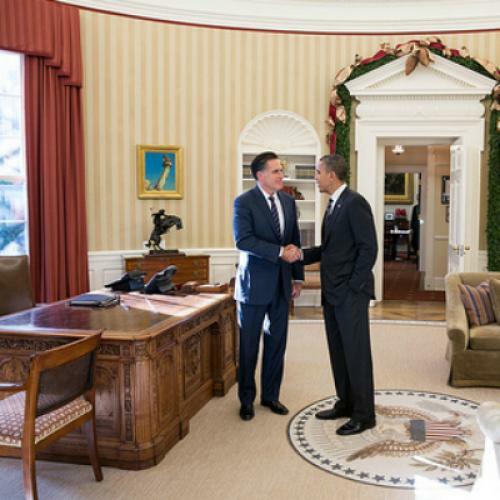 On Thursday, Barack Obama invited Mitt Romney to the White House for lunch. The two shared white turkey chili and repaired to President Obama's man cave, formerly known as the Oval Office, for photo ops. The transformation of the room became complete when, sometime in the past year, the president swapped out the fussy beige floral couches that formerly sat in the room for the possibly-velour tan behemoths you see before you. Though our sourcing is spotty on this, we suspect this is the only place Michelle would let the president put the furniture from his bachelor apartment. Or else they were the gift of an enthusiastic Ohio State fraternity, obtained during President Obama’s campaign travels in the state. The throw pillows, one can only assume, came free with a year's subscription to Sports Illustrated. The coffee table looks familiar: I could swear it's from the free section of Craigslist. The couches simply make form follow function: the room is the most important bro-out zone in the nation. It's a place you've got to get in the right mindset before entering, as Obama's personal secretary demonstrates below. It's a place where high fives are the coin of the realm. Except when fist bumps are. It's a place you can watch basketball. You can just toss the pigskin around by yourself whenever you need to unwind. Or check your form in the mirror. No one will judge you for needing to be close to a football at all times. Or for using one as a leather footstool. Nice, bro. Who needs Restoration Hardware? There's even a nice patio for just chilling out and having a beer with a buddy. Nerds might get paddled, though. Is this the real reason Orszag stepped down?